It's fun to speculate about the colorful past of this little white house at the Ohio and Erie Canal's Lock 38 in the Cuyahoga Valley National Park. It had a wild reputation during the canal's heyday, but these days, it is my favorite stop for information about the park. 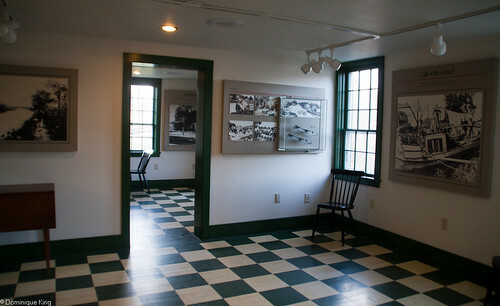 You can pick up maps and brochures at this Canal Visitor Center near the northern end of the park, but make sure to allow at least a few extra minutes explore the small on-site museum. The museum photos, videos, and other displays tell the story of 12,000 years of history in the valley, the history of the canal, and life in the area during the waterway's heyday as a major shipping and transportation route. 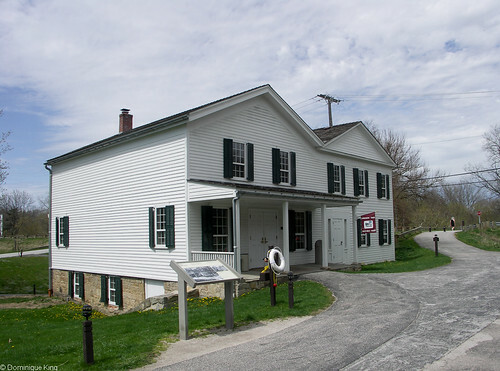 The white-frame building itself dates from the 1820s, includes an 1853 addition, and housed a tavern, a general store, and a home over the years according to a marker in front of the building. The marker also explains that the house had a "colorful reputation", earning it the nickname of "Hell's Half Acre". Check these "before" and "after" photos of the house at the National Parks Service site which show the "before" version of the building looking rather dilapidated during what I'd guess was a mid-1800s incarnation as a home, and a photo from after its acquisition and restoration by Cuyahoga Valley National Park in 1982. This park service page also notes that the building was once a dance hall as well. The building's proximity to Lock 38 led many people to believe the lock tender lived there. That conclusion seems to make some sense as the lock sits right in front of the house, but there is no record of the lock masters ever living there. The park and the Canal Information Center can be extremely busy during the summer, but the ranger on duty when we last visited the center in January of this year had plenty of time for a leisurely chat about the canal's history and what to see in the park. Lock 38 still has some water in it, with park staff and volunteers tending to the lock and demonstrating it in operation during summer weekends. We've always visited during the spring or winter, so I've yet to see the lock in operation. This, of course, gives me another excuse to visit again during warmer weather! Flooding in the canal basin can be a concern. The park service continues to preserve sites like Lock 38, with recent repairs to the lock that include stabilizing the grade behind the sandstone walls and repairing damage due to leakage in the walls. 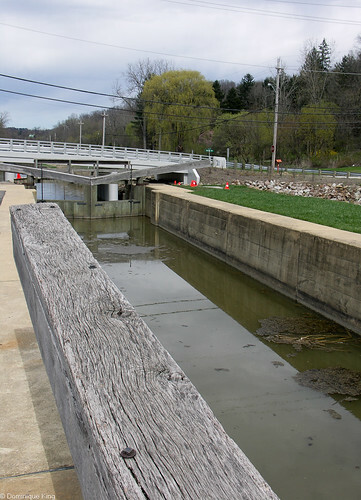 Be sure to check out my recent story, Erie and Ohio Canal: A short history and visiting Lock 29 along the CVNP Towpath Trail for a canal history overview and photos of another nearby Ohio and Erie Canal historic site in the park. 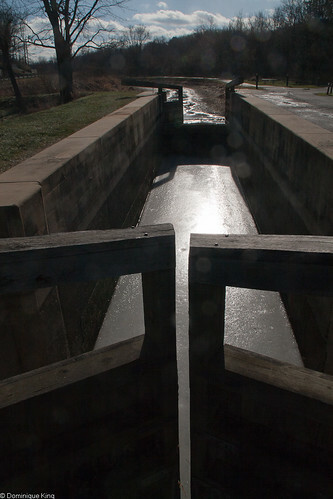 Interested in Ohio's canal history? Check out Canal Fever: The Ohio & Erie Canal, from Waterway to Canalway by Lynn Metzer and Peg Bobel, Ohio's Grand Canal: A Brief History of the Ohio and Erie Canal by Terry K. Woods, or A Photo Album of Ohio's Canal Era, 1825-1913 by Jack Gieck.